Walker Art Center, 9780935640984, 224pp. Graphic design has broadened its reach dramatically over the past decade, expanding from a specialized profession to a widely deployed skill. The rise of user-generated content, new methods of publishing and systems of distribution, and the wide dissemination of creative software have opened up new opportunities for design. More designers are becoming producers--authors, publishers, instigators and entrepreneurs--actively employing their creative skills as makers of content and shapers of experiences. Featuring work produced since 2000, Graphic Design: Now in Production explores the worlds of design-driven magazines, newspapers, books and posters; the entrepreneurial spirit of designer-produced goods; the renaissance in digital typeface design; the storytelling potential of film and television titling sequences; and the transformation of raw data into compelling information narratives. The catalogue features important original essays by leading designers that tackle themes such as the changing roles of reading and writing within the context of new technologies and self-publishing; the nature of design labor and production, from blue-collar handcraft and making to white-collar design thinking and strategy; and the impact and influence design programs and schools have had on shaping the direction of contemporary graphic design. Co-organized by Walker Art Center and Cooper-Hewitt National Design Museum, Graphic Design: Now in Production is conceived as a visual compendium in the spirit of the Whole Earth Catalogue. 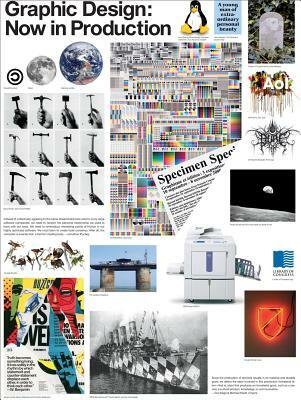 It features posters, info graphics, fonts, books, magazines, film titles, logos and more, interspersed with a variety of small texts delving into specific project details, excerpted artists' statements, interviews and published manifestos, technical details, and new and old technologies and tools.